I don’t consider having more or better ideas than others. But I gradually realized I have less and less time for some activities like programming, electronics etc. Maybe that’s how we realize we are getting older now adults. So I decided to share these ideas rather than fueling the illusory idea that I will implement them one day. 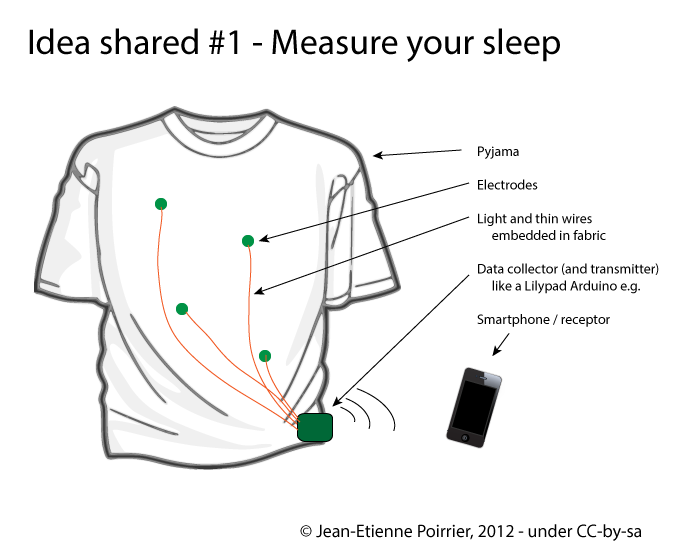 So idea 1 is about measuring sleep. I recorded animals’sleep during my Ph.D. – but it was thanks to an EEG device. I think that if you want to understand or improve something you have to first measure it in a way or another. So I started to try to measure my own sleep with an app (Sleep Cycle). But despite its good reviews it doesn’t work, at least for me. 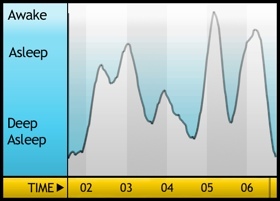 For instance the chart below is supposed to represent my sleep cycle for the night of the September 14th, 2012. I was certainly not in deep sleep at 1.30AM (baby did not want me to sleep immediately). I also woke up around 4AM (baby was again the reason). And I woke up at 6.45 (with a backup clock – had to wake up for work)? The last version of the Sleep Cycle app improves things a bit by providing more statistics (so at last you can rely on the approximate time slept and compare your “sleep” across days etc. ), more beautiful gaphs and the ability to download raw data. Don’t be fooled however, “raw data” means only start time, end time, sleep quality (how is it measured? ), time in bed, number of wake ups and sleep notes. You unfortunately won’t be able to reproduce anything like the graph above. Hardware devices like the Wakemate or the Zeo might give better results because part of the solution is using a real accelerometer. But the Up story shows that not everything is obvious in this world. For me the fundamental flaw is to rely only on body movements to detect, quantify and even score sleep. Of course there is an abundant scientific literature about how muscle tone (of different muscles) is related to sleep stages (see here and here for introductory texts). But this is often measured by electrodes glued on your body. The other advantage would be that in such way you may also measure electrical activity through the body. Will it work? I’m sure of it. Will it be enough to sleep correctly? I don’t think so: it’s not because you measure something that it improves. But at least you will have some clue on what is going on. Some other advices may be interesting. And for the moment nothing replaces a visit to a real doctor / sleep specialist!